I always get a kick out of email forwards. It is amazing how many of them are flat out wrong. Honestly, I can't think of any that I have received that are true. The latest that I received is the "Smart Car? Accident" forward. 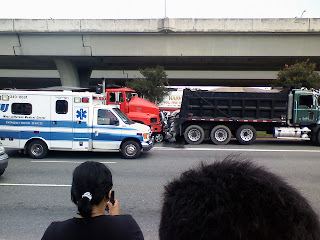 Below is a photo of a wreck in Jefferson Parish, LA (near New Orleans ) between two trucks and a Smart Car. Think I’ll pass on the Smart Car. 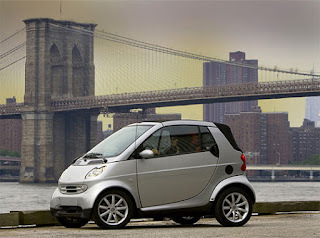 Now I am no fan of the Smart car and unlike many, I have ridden in one (my company has one). Yeah, it works as transportation but that is about it. The transmission is harsh, and so is the ride thanks to a short wheelbase. The fuel mileage is good, but no different than a Volkswagen Jetta SportWagen TDI. Check out the comparison. Plus with the Jetta I can haul three (or an uncomfortable four) of my buddies, with Clyde the wonder lab in the back. I would have to leave Clyde at home in a Smart. Take a look at the crushed cars wheel and compare it to the un-crushed Smart car above. The crushed wheel has five lug bolts, but the Smart only has three... That is a pretty solid clue that the crushed car isn't a Smart car. Heck, it probably isn't even a compact as most of those will have four lugged wheels. 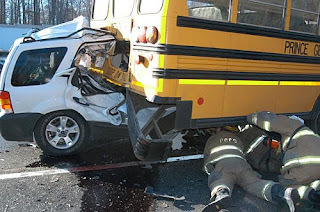 Taking a peek over at my favorite forward busting website, Snopes, I found out that it was most likely a Ford Escape crushed between the two trucks. Ironic because an Escape is a small SUV, the type of vehicle that someone sending this forward is trying to qualify as better in accident. Honestly, I don't know if there is anything that you can drive short of another dump truck that would save you in that situation. That is about as bad as a vehicular sandwich can get. This kinda proves that. 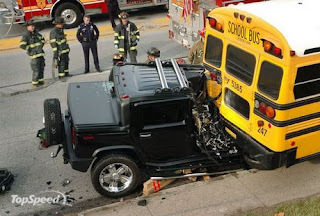 I'm kinda thinking that we should all just drive school buses. They seem to take a hit pretty well. The moral of this story is, if you want to prove that small vehicles are less safe than larger, just use good old fashioned data.